Particle Kid (Micah Nelson) opened the show at 4:30, but because most of the ads said the show would start at 5PM, very few people were there to hear him in the 17,500-seat amphitheater, and it was unfortunate. Kid has an emotional voice that easily filled the space, with a bend toward the sound of an early Neil Young. He ended his set with some guitar smashing and then his angry “Everything is Bulls–t. Lukas Nelson and his Promise of the Real band rattled Willie fans that had not heard them yet. His part traditional country, part blues, part singer-songwriter set was well planned to introduce himself and capture the mood for the types of music to be heard the rest of the night. The younger Nelson’s guitar skills are mesmerizing, and he has the ability to draw you so deeply into his playing that you forget about his amazing, familiar voice, which comes back in to spin you again. His song “Turn Off the News” — a protest to America’s addiction to customized information — was well received and got the tie-dyed Deadheads on their feet. Margo Price is always a good choice for any festival, and on this night she seemed to hug Los Angeles from her heart. Price’s band was rotated into view by a revolving stage as Nelson’s gear was spun off. A divider down the middle separated the front from the back so the next band was free to set up behind the divider, saving loads of time. Price sang some songs from her first album, Midwest Farmer’s Daughter, and even crawled back to play drums for “Four Years of Chances.” Her new song, “All American Made,” whispered elegantly through the Hollywood Hills as the flag floated in the breeze and the sun began to set, making Price look like the star of her own movie. Sturgill Simpson led the night in surprises. The Grammy-winning artist came prepared to sing his hits, but seemed to improvise most of his set with some ornery guitar riffs. Simpson has always claimed he isn’t a good guitar player, but if what he does isn’t good, then everyone else should go back to school. Simpson’s band stayed on their toes to keep up with him, and they were so honed into one another it was as if the audience didn’t exist. He had the place silenced with his version of When in Rome’s “The Promise,” which is on his album, MetaModern Sounds in Country Music. After the birth of his third child recently, Simpson said he would take a few months off before trying some new things he is rolling out next year. Then, it was time for Willie Nelson, who waltzed onstage in a Dodger’s jersey expecting participation before he’d sing “On the Road Again” or “ Mamas Don’t Let Your Babies Grow Up…” The Hollywood Bowl was happy to oblige. In California, “Roll Me Up and Smoke Me When I Die” is always a good idea, but Nelson’s new song “Vote Them Out” also played particularly well here. 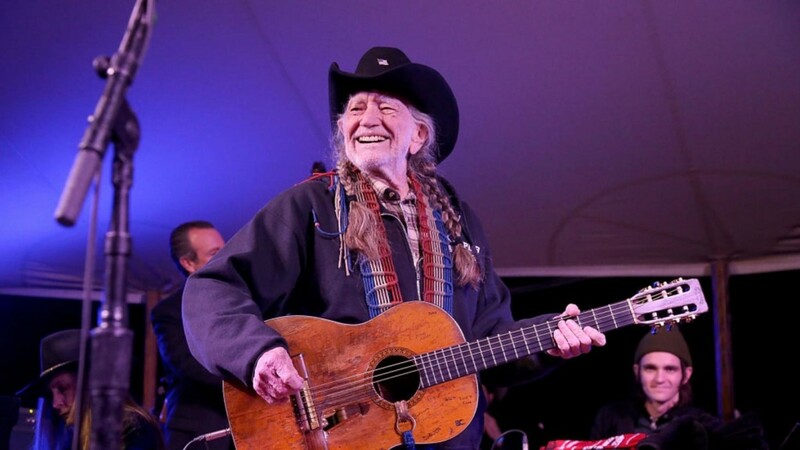 The country icon stood back and allowed Lukas to lead the gritty Stevie Ray Vaughan cover of “Texas Flood,” solidifying that fact the Nelson line and brand of music will continue for years to come. This entry was posted on Tuesday, October 23rd, 2018 at 7:29 pm and is filed under Lukas Nelson, Micah Nelson, Outlaw Music Festival, Photographs. You can follow any responses to this entry through the RSS 2.0 feed. You can leave a response, or trackback from your own site.